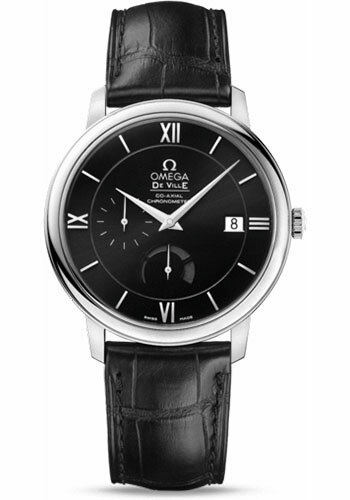 39.5 mm stainless steel case, domed scratch-resistant sapphire crystal with anti-reflective treatment inside, black dial with Roman numerals and index hour markers, self-winding chronometer Omega 2627 movement with Co-Axial Escapement, date, power reserver, and small seconds, approximately 48 hours of power reserve, black leather strap. Water resistant to 100 m.
39.5 mm stainless steel case, domed scratch-resistant sapphire crystal with anti-reflective treatment inside, silver dial with Roman numerals and index hour markers, self-winding chronometer Omega 2627 movement with Co-Axial Escapement, date, power reserver, and small seconds, approximately 48 hours of power reserve, black leather strap. Water resistant to 100 m.
39.5 mm steel case, steel bezel, sapphire crystal with anti-reflective treatment inside, silver dial with red gold-coloured roman numeral hour markers and polished cabochons, caliber 2627 self-winding movement with chronometer, co-axial escapement with rhodium-plated finish, approximately 48 hours of power reserve, brown leather strap. Water resistant to 30 m (100 ft). 39.5 mm stainless steel case, scratch-resistant sapphire crystal anti-reflective treatment inside, vertically deep-brushed rhodium-silvery dial with polished Roman numeral hour markers and cabochons, Caliber Omega 2627 self winding movement with rhodium-plated finish, chronometer, date, power reserve indicator, approximately 48 hours of power reserve, blue leather strap. Water resistant to 3 bar (30 metres / 100 feet). 39.5 mm stainless steel case, scratch-resistant sapphire crystal anti-reflective treatment inside, white silvery dial with a silk-like pattern and an opaline finish, Caliber Omega 2627 self winding movement with rhodium-plated finish, chronometer, date, power reserve indicator, approximately 48 hours of power reserve, hunter green leather strap. Water resistant to 3 bar (30 metres / 100 feet). 39.5 mm steel case, steel bezel, sapphire crystal with anti-reflective treatment inside, blue dial with roman numeral hour markers and polished cabochons, caliber 2627 self-winding movement with chronometer, co-axial escapement with rhodium-plated finish, approximately 48 hours of power reserve, black leather strap. Water resistant to 30 m (100 ft). 39.5 mm stainless steel case, scratch-resistant sapphire crystal anti-reflective treatment inside, grey dial with polished Roman numeral hour markers and cabochons, Caliber Omega 2627 self winding movement with rhodium-plated finish, chronometer, date, power reserve indicator, approximately 48 hours of power reserve, grey leather strap. Water resistant to 3 bar (30 metres / 100 feet). 39.5 mm stainless steel case, scratch-resistant sapphire crystal anti-reflective treatment inside, grey dial with a silk-like pattern and an opaline finish, Caliber Omega 2627 self winding movement with rhodium-plated finish, chronometer, date, power reserve indicator, approximately 48 hours of power reserve, blue leather strap. Water resistant to 3 bar (30 metres / 100 feet).